Time4Learning offers an online, interactive elementary school science curriculum for grades K-5. The elementary school science content covers science inquiry, science contributors, physical science, life science, and earth and space science. Materials are taught using a combination of animated lessons, instructional videos, worksheets, quizzes, tests, and both online and offline projects. The K-3 curriculum is enhanced with content from Science4Us, a comprehensive, digital science program for early elementary students. Use of Instruments: Identify various instruments used to collect and analyze data. Working Collaboratively: Describe benefits and challenges of working collaboratively. Recognize that teammates should be free to reach, explain, and justify their individual conclusions. Comparing & Constrasting: Identify and use the essential science skills of comparing and contrasting when making observations. Show Scientific Ideas: Use sketches, diagrams, and models to represent scientific ideas. Predictions & Inferences: Make predictions and inferences based on observations. Use of Tables & Graphs: Use tables and graphs to identify patterns of change. Scientific Contributions: Use reference materials to obtain information about the contributions of Alexander Graham Bell (sound), Copernicus (astronomy), Mae Jemison (exploration of space), and John Muir (ecology). Explaining Concepts: Conclude that events or concepts can be explained by collecting, organizing, and interpreting data. Scientific Discoveries: Identify specific scientific discoveries that have helped or hindered scientific progress in understanding human health and the environment. Scientific Processes: Describe how the use of scientific knowledge can help people solve problems, make decisions, and form new ideas. Science Tools: Students learn about the different tools used in science and how they help us study and learn about the world around us. In first grade science, students grow their understanding of everyday objects and how they work in their daily lives. In this activity from Science4Us, students unscramble syllables of science-related words and hear their definitions. Magnetism: Students will learn that magnetism is a force you cannot see that acts upon objects, that they contain iron, that they can be used to push and pull objects, and more. Physical Properties: Determine the physical properties of matter using customary and metric measurements that incorporate tools such as rulers, thermometers, and balances. Physical Changes: Identify matter as liquids, solids, and gases. Identify and describe examples of physical changes in the states of matter produced by heating and cooling. Weight: Investigate and realize that the weight of an object is equal to the sum of the weights of its parts. Observation: Use hand lenses to observe and document minute physical properties of objects. Heat & Light Objects: Identify objects that emit heat and light. Forms of Energy: Identify different forms of energy, such as heat, light, and sound. Role of Sun: Demonstrate an understanding that the Sun provides energy for Earth in the form of heat and light. Sources of Heat: Demonstrate understanding that heat can be produced by chemical reactions, electrical machines, and friction. Measuring Energy: Identify and use a variety of tools to measure the gain or loss of energy. Heat Transference: Demonstrate understanding that when a warmer object comes in contact with a cooler one, the warm object loses heat and the cool one gains it (until they are both the same temperature). Energy for Life: Demonstrate understanding that some source of energy is needed for organisms to stay alive and grow. Natural Resources: Identify natural resources and their importance. Renewable/Nonrenewable: Classify resources as renewable or nonrenewable. Describe uses for renewable and nonrenewable resources. Effects on Environment: Identify ways that using natural resources for producing energy affects the environment. Energy Causes Motion: Describe how energy is necessary to create a force that can cause motion. Motion of Objects: Describe the motion of various objects, including forward, circular, and wave motions. Elements of Waves: Identify the characteristics of waves, including crest, trough, and length. Simple Machines: Identify these six types of simple machines: screw; inclined plane; wedge; pulley; lever; wheel and axle. Force Causes: Demonstrate understanding that force causes change. Position/Direction of Objects: Measure and record changes in the position and direction of the motion of an object on which force (such as a push or pull) has been applied. Materials and Mixtures: Students learn that everything around them is made up of different materials and can be combined to make mixtures. Observing Matter: Students are introduced to matter and how its properties are described using qualitative and quantitative observations. States of Matter: Student learn how on earth, matter is found most commonly in three different phases: solid, liquid, and gas. Changes in Matter: Students examine how solids, liquids, and gases can undergo changes based on the physical and chemical properties of the matter. Energy Sources: Students come to understand energy, which comes from a variety of sources and is used every day in many different ways. Light Energy: Students explore light energy, and how it is energy that can be seen and is generated by natural and manmade sources. Heat Energy: Students learn about heat energy, or energy that can be felt and moves from hot to cold by conduction and radiation. Sound Energy: Students come to understand how sound energy travels in waves and can be described by volume and pitch. Electrical Energy: Students learn about electrical energy and how it is made by humans at power plants by converting renewable and nonrenewable sources into electricity. Energy Transformations: Students explore how energy can be transformed from one form to another as it is used by living and nonliving things. Location and Perspective: Students are introduced to the location of an object and how it can be identified from multiple perspectives to determine motion. Motion: Students come to understand how motion is a change in position and can be measured by distance and time. Force: Students learn about force, and how a push or pull is needed to change the position of an object. Magnets: Students are exposed to magnets, their shapes and sizes and how they can be used to move objects made of iron. Simple Machines: Students learn about simple machines that are used every day to make work easier by reducing the force needed to move an object over a distance. In second grade science, students gain knowledge of the needs and characteristics of animals and the way they interact with their own distinct environments. In this activity from Science4Us, students draw a picture in their online notebook of where they live. Life science covers living things and balance in nature. Distinguish Living & Nonliving: Distinguish between living and nonliving things. Know that living things need food, water, space, and shelter to survive. Describe plants and animals that live in an ocean habitat, and group them as plant or animal. Different Animal Environments: Know that animals inhabit different kinds of environments and have external features that help them thrive in different kinds of places. Amphibians: Describe the general features of amphibians. Name specific amphibians, and describe the life cycles and habitats of each. Classify Animals: Classify, group, and compare animals into scientific categories such as plant eaters, meat eaters, and plant/meat eaters. Steps in Life Cycle: Identify a cycle as a process with no beginning or end. Briefly explain the steps in the life cycle: birth, growth, reproduction, and death. Food Chain: Identify and describe a food chain. Label a chart that illustrates a simple food chain. Basic Needs of Animals: Identify the basic needs of animals, including shelter and living space. Pond Habitat: Identify plants and animals found in a pond habitat. Describe the food chain of a pond. Wetland Habitat: Identify characteristics of a wetland habitat, plants and animals found in a wetland habitat, and examples of adaptations. Ocean Habitat: Identify characteristics of an ocean habitat, plants and animals found in an ocean habitat, and examples of adaptations. Habitats: Identify habitats and the relationships among organisms and their environment. Balance of Nature: Describe the concept of the balance of nature, and know that nature is constantly changing. Food Chain: Identify and describe the food chain: producers, consumers, and decomposers. Effects on Ecosystems: Identify the concept of an ecosystem and how ecosystems can be affected by changes in environment such as precipitation, food supply, and changes caused by humans. Environmental Threats: Identify and describe man-made threats to the Environment (such as air and water pollution caused by emissions, smog, industrial waste, and chemical run-off). Environmental Protection: Describe measures people can take to protect the environment. Extinction: The learner will understand that some kinds of organisms that once lived on earth have completely disappeared. Animal & Plant Link: Describe the various ways that animals depend on plants for survival (including food, shelter, and oxygen). Modifying the Environment: Describe how living organisms (for example, beavers and birds) modify their physical environment to meet their needs. React to Changing Environment: Understand that when the environment changes, some plants and animals survive and reproduce, and others die or move to new locations. Extinction: Identify organisms that once lived on earth, and have completely disappeared. Vertebrate Animals: Identify the distinguishing characteristics of vertebrate animals (mammals, birds, fish, reptiles, and amphibians). Invertebrate Animals: Identify the distinguishing characteristics of invertebrate animals: flatworms, centipedes, sun jellyfish, black widow spiders, and octopuses. Comparing Plants: Identify similarities and differences among plants. Organism Competition: Identify ways that organisms with similar needs compete with one another for resources (such as oxygen, water, food, and space). Classifying Organisms: Demonstrate understanding that living organisms get energy from the food they eat and that living things are classified as producers, consumers, carnivores, herbivores, and omnivores. Population Constraints: Demonstrate understanding that the size of a population is dependent upon the available resources. Recycling: Identify and describe reusing, recycling, and reducing and how these processes improve and protect the condition of Earth. Living and Nonliving: Students learn how living things have four specific characteristics: they are made up of parts, they use energy to grow, they respond to their environment, and they reproduce. 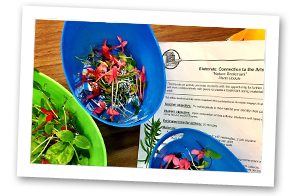 Plants: Students explore plants and how they are living things that have needs, reproduce, respond to their environment, and are made up of different parts. Animals: Students cover animals and how they are living things that have needs, reproduce, respond to their environment, and are made up of different parts. Food Webs: Students come to understand food chains and food webs, which illustrate the flow of energy through a system of living things. Habitats: Students explore a habitat, which is made up of the living and nonliving things an animal or plant needs to thrive. Eco Awareness: Students learn how they can be eco aware by practicing the three Rs of reduce, reuse, and recycle as well as being sensitive to the needs of the other living things that share the environment with us. In the plants module, students can connect science with art by creating bookmarks. They'll learn the parts of flowers and plants while creating something beautiful and useful. Earth/Space Science lessons cover Earth and space. Weather Map: Use graphic organizers, such as calendars and graphs, to display weather data and show weather patterns. Know how to read a simple weather map. Identify the cycle of seasons and describe weather patterns associated with those seasons in North America. Thunderstorms: Explore thunderstorms, and describe characteristics of thunder and lightning. Describe basic safety measures needed in thunderstorms. Water Cycle: Describes the water cycle. Solid Earth: The student recognizes that the solid materials making up the Earth come in all sizes, from boulders to grains of sand. Moon and Earth: Know that the Moon moves around the Earth, the Earth moves around the Sun, and the Moon is only visible when it reflects the Sun's light. Describe the relationship of the Earth's rotation to a 24-hour day. Objects in the Sky: Identify objects seen in the sky, including clouds, the Sun, stars, the Moon, etc. Know that stars and planets are always in the sky, even in the daytime. Universe & Galaxies: Identify and describe the universe and galaxies, including the Milky Way and Andromeda. Effects of Planetary Motions: Identify the planetary motions of rotating and revolving and their effects on Earth, including the causes of day, night, and the seasons. Also identify where the sun rises (east) and sets (west), that days and nights change in length throughout the year, and the effect of the earth's tilted axis on the seasons. Gravitational Effects: Demonstrate an understanding of the gravitational effect of the Moon (and to a lesser degree, the Sun) on the Earth's tides. Asteroid, Meteor, Comet: Identify characteristics of asteroids, meteoroids, and comets (include Haley's comet). Solar Eclipse: Describe the cause of a solar eclipse. Space Exploration: Investigate and record data about space exploration that includes telescopes, rockets, satellites, the first moon landing, by Apollo 11, and the space shuttles. Mesozoic Era: Students will discover the Mesozoic Eras on Earth. Factors of Surface Changes: Demonstrate understanding that the surface of Earth can be changed by forces such as earthquakes, glaciers, and volcanoes. Origins of Small Rocks: Demonstrate understanding that smaller rocks come from the breaking and weathering of bedrock and larger rocks. Amount of Water: Demonstrate understanding that about 75 percent of Earth's surface is covered by water, and describe the stages of the water cycle. Weathering & Erosion: Identify and describe characteristics of the process of weathering and erosion, such as weathering of landforms and erosion of soil. History of the Earth: Students learn that fossils of plants and animals, earthquakes, and volcanoes are all evidence of how the Earth has changed over time and continues to change today. Materials: Students learn that rocks, water, and soil are some of the materials that make up Earth. Features: Students come to understand that the earth's features are the natural shapes on the Earth's crust. Made up of rock or water, they change due to weathering and erosion. Weather: Students learn how weather is hot or cold, or wet or dry. Weather can be observed and measured using tools. Exploring the Universe: Students learn how to use special tools to observe the galaxies, stars, and solar systems found in the Universe. Earth in Space: Students understand how earth's motion and position in space results in predictable patterns of change, including day/night, seasons and the phases of the Moon. In fourth grade science, Lucas learns about digestion in the lesson Digestion: Step by Step. In this lesson, students are asked to respond to questions about what each system in the body is responsible for.